The Marketing Automation world has a bold, new competitor from the open source world. Enter: Mautic! Marketing Automation is this decade’s hottest technology for Content Marketers, CMS pros and marketing technologists worldwide. HubSpot, Marketo, InfusionSoft, Salesforce Pardot (aka “Engage”), Adobe, Oracle, and a host of others come to mind. They’ve all been actively fighting for marketshare and mindshare, as the rapid disruption of the outbound advertising world continues. Inbound’s marketing automation technology has been successfully displacing legacy outbound media ever since – one landing page, email or whitepaper download at a time. Missing in the mix up until this year has been a free, open source player in the Marketing Automation mix. Enter Mautic: the first, and still the only free, open source marketing automation brand on today’s market. 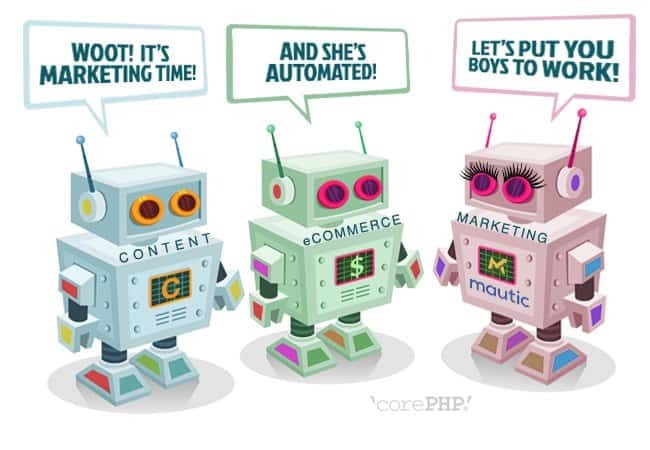 Mautic Open Source marketing automation software launched this year. I’ve been keeping an eye on the Mautic team’s progress for well over a year now, as they readied themselves for market, and launched into the scene quietly, with CEO and co-founder David Hurley at the helm. As a past lead developer for Joomla CMS, and a long-time open source advocate, David’s got the technical experience, the patience, the resilience, and the “duct tape marketing” savvy to bring Mautic to fruition. About two months ago, I began actively using Mautic as an alternative to HubSpot, Marketo and Salesforce Pardot. Automated marketing campaign building is now part of our professional service offering as well. In addition to HubSpot, Pardot and Marketo integration, our company now provides full-blown Mautic campaign development. Thanks to the open source community behind Mautic, following David’s vision, we’re now a part of their ecosystem. There are several reasons why I selected Mautic, which I’ll touch on here breifly, and expand upon in future posts. But there’s just one real killer reason Mautic was for me. Free, Open Source, and Private Data #FTW! Aside from Mautic’s solid framework and dedicated professional development team, the primary reason for my choice of Mautic is the fact that Mautic is available as a free, open source, privacy-independent offering (OK, I know, that’s a 3-part answer, I know. So sue me). 1) Free as in “free parking.” There’s no cost to download, install and/or use Mautic. They even have a free hosted version, if you’re up for that. Very cool. 2) Open Source Software. I value the many benefits of open source licensing (highly extensible, customizable, with no vendor lock-in, to name a couple biggies), and the seasoned staff at Mautic knows how to lay down some great code. 3) Privacy. Call me old-fashioned and paranoid, but If I have a choice to willfully allow all my (and my clients’) sensitive data to be at the disposal of a third party, versus keeping all that data secure – I choose “secure.” I love that I can download and install Mautic on my own server, if I want to! Flexible codebase – Goodbye, vendor lock-in, hello independence! Extensible architecture – know anything about how to build a plug-in? You’ll love Mautic. Excellent support – Slack-based live support is outstanding! Corporate backing – There’s a financial raison d’être for Mautic, and that’s a good thing. This isn’t just another free-wielding “project,” run amok. David Hurley wisely followed the Dries Buytaert / Acquia / Drupal model for building Mautic. David’s company is called Allyde (pronounced “allied). Mautic still has got a ways to go before matching up to the ease of use and user-friendly aspects of HubSpot; then again, Mautic didn’t kick off with tens of millions of investment dollars either. That isn’t to say Mautic isn’t benefitting from the major investments made in brands such as HubSpot, Marketo, etc. Such is the benefit of many open source projects, coming onto the scene long after the software category itself has matured, after several billion dollars and tens of thousands of hours have been invested, establishing the underpinnings of the tech category itself. Mautic now enters the scene with with one major task: writing the code. They benefit from years of trial and error to establish workflows, best practices, accepted terminology, documentation, training, thousands of case studies, a pre-existing vendor ecosystem, events and media support, and so much more. Mautic’s relatively low buy-in at the poker table may serve as a huge advantage. Is The Timing Right for Open Source Marketing Automation? The same field that’s been plowed and seeded for several years by HubSpot, Marketo and Pardot is now bearing fruit for those capable of reaching the low-hanging limbs. It seems like perfect timing for the Mautic team to be entering the market with an open source solution. Now, the question is, will Mautic’s open source team respond and deliver a fully capable offering quickly enough to participate in a bountiful harvest? In other words, will the market respond with strong demand for a high-quality open source solution? We shall see, but all signs are positive so far. More to come on this topic! This entry was posted in Marketing Automation and tagged HubSpot, Marketing Automation, Marketo, Mautic, Open Source, Open Source Marketing Automation, Pardot, Salesforce on September 2, 2015 by John Coonen. This is my first time Mautic, I am very happy that you bring out this information here. It is very useful that we have this kind of tool in our arsenal, especially in this very competitive time. What I like about Mautic is its Free and no cost to download, It’s an open source software and you can have your privacy over this software. I love to know more about it, so I’d better subscribe so I can have more updates in the coming days. Thanks for posting this topic.